Water Prices Across the United States: How Does Your Bill Stack Up? If you’re like me, you don’t spend very much time thinking about your water bill. You turn the water off when you’re brushing your teeth and limit your shower time, but in the end, you use what you use and you pay for it every month, just like everyone else across the country. In reality, though, things are a bit more complicated; what you pay depends a lot on where you live. Most cities charge a fixed fee to start off with, but beyond that they have a number of different rate structures to choose from. For example, Memphis, New York, and Chicago charge a uniform rate for every unit of water consumed. Fresno, California does as well, though given the recent drought in California, there have been calls to re-evaluate water pricing in a number of California cities. 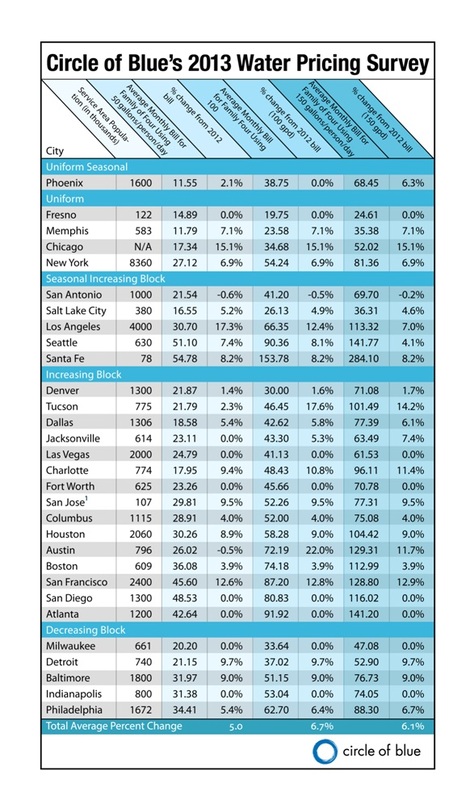 Denver, Jacksonville, and Boston use an “increasing block”structure where users are charged more for higher amounts used. Users in these areas might pay a lower rate for the first 1000 cubic feet of water consumed, but a higher rate for the next. This structure provides a stronger incentive to conserve water than a uniform price structure, since the price per unit increases the more you use. A “decreasing block”structure, used by a handful of major cities like Baltimore, Detroit, and Indianapolis, is the opposite. Users in these cities are charged less for higher amounts of water used, providing less of an incentive to conserve. Cities acknowledging seasonal variation in water availability include Phoenix, Salt Lake City, Los Angeles, and Seattle. The latter three cities use a seasonal increasing block structure, which is similar to the increasing block structure –the difference is that rates are higher in the peak season. Phoenix uses a seasonal uniform block structure where the prices paid during peak season and low season do not depend on the amount used. So, in which cities do consumers pay the most for their water use? According to a 2013 survey by Circle of Blue, an association of scientists and journalists focused on water issues, average water bills for the 30 major U.S. cities vary quite widely. For a family of four using 50 gallons of water per person per day, the average monthly water bill in Phoenix was the lowest at just $11.55. Other low payers include Memphis ($11.79) and Salt Lake City ($16.55). On the other end of the spectrum, a family of four using the same amount of water in Santa Fe, New Mexico could expect to pay $54.78 per month. Seattle residents paid the second highest at $51.10, perhaps the opposite of what one would expect given the city’s rainy reputation. San Diego, San Francisco, and Atlanta all had average monthly bills of over $40. Here in Boston, the average monthly bill for a family of four consuming 50 gallons of water per day is somewhere in the middle at $36.08. Lindsey Webb is a second year FPAN student who is very excited about graduating in May, in part because she can binge-watch all of the Chopped episodes she missed this year. Learn more about her on our Meet Our Writers page. How Does Your Bill Stack Up ?” I live in Ranier, Minnesota and our water rates are going up to $66.51 for 6,000 gallons. Would that be the highest in the country ? We buy our water from International Falls 3 miles down the road. We have an abundant natural water supply that I used to drink directly from the Rainy Lake (where Int’l Falls draws its water from). Can it cost that much to treat it? Any information you can shed on this subject would be most appreciated.